The Mixtón War was fought from 1540 until 1542 between the Caxcanes and other semi-nomadic Indigenous people of the area of north western Mexico against Spanish invaders, including their Aztec and Tlaxcalan allies. The war was named after Mixtón, a hill in the southern part of Zacatecas state in Mexico which served as an Indigenous stronghold. Although other indigenous groups also fought against the Spanish in the Mixtón War, the Caxcanes were the "heart and soul" of the resistance. The Caxcanes lived in the northern part of the present-day Mexican state of Jalisco, in southern Zacatecas, and Aguascalientes. They are often considered part of the Chichimeca, a generic term used by the Spaniards and Aztecs for all the nomadic and semi-nomadic Native Americans living in the deserts of northern Mexico. However, the Caxcanes seem to have been sedentary, depending upon agriculture for their livelihood and living in permanent towns and settlements. They were, perhaps, the most northerly of the agricultural, town-and-city dwelling peoples of interior Mexico. The Caxcanes are believed to have spoken a Uto-Aztecan language. Other Native Americans participating in the revolt were the Zacatecos from the state of the same name. The first contact of the Caxcan and other indigenous peoples of the northwestern Mexico with the Spanish, was in 1529 when Nuño Beltrán de Guzmán set forth from Mexico City with 300-400 Spaniards and 5,000 to 8,000 Azteca and Tlaxcalan allies on a march through Nayarit, Jalisco, Durango, Sinaloa and Zacatecas. Over a six-year period Guzmán, who was brutal even by the standards of the day, killed, tortured, and enslaved thousands of Indians. Guzmán’s policy was to "terrorize the natives with often unprovoked killing, torture, and enslavement". Guzmán and his lieutenants founded towns and Spanish settlements in the region, called Nueva Galicia, including Guadalajara in or near the homeland of the Caxcanes. But the Spaniards encountered increased resistance as they moved further from the complex hierarchical societies of Central Mexico and attempted to force Indians into servitude through the encomienda system. The command structure of the Caxcanes is unknown but the most prominent leader from among them who emerged was Tenamaztle ( Francisco Tenamaztle) of Nochistlan, Zacatecas. After their defeat the Caxcanes were absorbed into Spanish society and lost their identity as a distinct people. They would later serve as auxiliaries to Spanish soldiers in their continued advance northward. Spanish expansion after the Mixtón War would lead to the longer and even more bloody Chichimeca war (1550–1590). The Spanish were forced to change their policy from one of forcibly subjugating the Indians to accommodation and gradual absorption, a process taking centuries. ^ Padilla, D. Matias de la Mota. Historia de la Conquista de la Provincia de la Nueva-Galicia. Mexico Imprenta del Gobierno, 1870, p. 115. The phrase in the reference is "le mataron, Y asado se le comieron." ^ ^ Ewing, Russell C.; Edward Holland Spicer (1966). Russell C. Ewing. ed. Six faces of Mexico: history, people, geography, government, economy, literature & art (2 ed.). Tucson: U of AZ Press, 1966. p. 126. Retrieved August 2009. 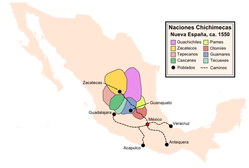 "The Spaniards did not break through into the Chichimeca country until 1541 when several groups of Chichimeca Indians were defeated in the Mixtón War"
Altman, Ida. The War for Mexico's West: Indians and Spaniards in New Galicia, 1524-1550. Albuquerque: University of New Mexico Press 2010. Bolton, Herbert Eugene; Thomas Maitland Marshall (1920). The colonization of North America, 1492–1783 (Kessinger Publishing reprint ed.). New York: Macmillan Co. OCLC 423777. Giudicelli, Christophe; Pierre Ragon (2000). "Les martyrs ou la Vierge? Frères martyrs et images outragées dans le Mexique du Nord (XVIème-XVIIème siècles)" (reproduced online at Nuevo Mundo—Mundos Nuevos, 2005). Cahiers des Amériques latines (second series) (in French). Paris: Institut des Hautes Études de l’Amérique latine (IHEAL), Université Paris III - Sorbonne Nouvelle and Centre de Recherche et de Documentation sur l’Amérique latine (UMR 7169, CNRS); distributed by La Documentation Française. 33 (1): 32–55. ISSN 1141-7161. OCLC 12685246. INAFED (Instituto Nacional para el Federalismo y el Desarrollo Municipal) (2005). "Nochistlán de Mejía, Zazatecas". Enciclopedia de los Municipios de México (in Spanish) (online edition at E-Local ed.). México D.F. : INAFED, Secretaría de Gobernación, Gobierno del Estado de Zacatecas. Archived from the original on 2007-09-27. Retrieved 2007-12-14. López-Portillo y Weber, José (1939). La rebelión de Nueva Galicia. Pan American Institute of Geography and History, Publication 37 (in Spanish). Tacabuya, Mexico: original imprint by E. Murguia. OCLC 77249201. Monroy Castillo, María Isabel; Tomás Calvillo Unna (1997). Breve historia de San Luis Potosí. Serie breves historias de los estados de la República Mexicana (in Spanish) (Reproduced online at the Biblioteca Digital, Instituto Latinoamericano de la Comunicación Educativa (ILCE) ed.). México D.F. : El Colegio de México, Fideicomiso Historia de las Américas, and Fondo de Cultura Económica. ISBN 968-16-5324-6. OCLC 39401967. Retrieved 2007-12-14. Rabasa, José (2000). Writing Violence on the Northern Frontier: The Historiography of Sixteenth-Century New Mexico and Florida and the Legacy of Conquest. Durham, NC: Duke University Press. ISBN 0-8223-2535-7. OCLC 43662151. Rojas, Beatriz; Jesús Gómez Serrano; Andrés Reyes Rodríguez; Salvador Camacho; Carlos Reyes Sahagún (1994). Breve historia de Aguascalientes. Serie breves historias de los estados de la República Mexicana (in Spanish) (Reproduced online at the Biblioteca Digital, Instituto Latinoamericano de la Comunicación Educativa (ILCE) ed.). México D.F. : El Colegio de México, Fideicomiso Historia de las Américas, and Fondo de Cultura Económica. ISBN 968-16-4540-5. OCLC 37602467. Retrieved 2007-12-14. Schmal, John P. (2004). "The History of Zazatecas". History of Mexico. Houston Institute for Culture. Retrieved 2007-12-14.